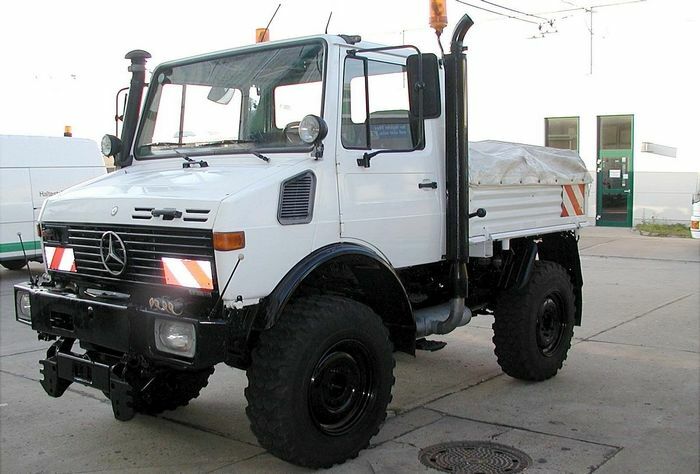 The breakdown lorry of the German type DB UNIMOG 427/10 is using for the shunting and towing of defective buses and trolleybuses. The vehicle is a 2 axle, four wheel drive. The vehicle is equipped to travel on heavy terrain. It is equipped with 2 yellow warning lights and many different work tools. The vehicle has a payload of 3000 kg. On the loading area of the vehicle is a ballast weight made of concrete. The vehicle may be equipped with tires of the sizes 12,5-20 MPT 12 PR or 12,5R20 MPT 12 PR. The breakdown lorry have the registration number BAR-CE 981. The vehicle got the first license on 26 July 1989. The photo show the breakdown lorry in front of the workshop hall at the depot Eberswalde/Nordend. The next photo shows the breakdown lorry in action at the terminal stop Ostend on 07 August 2002. 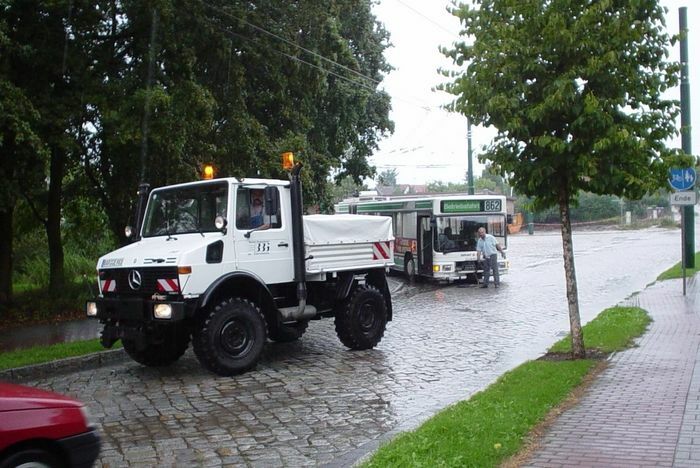 After a lightning into the trolleybus overhead system during a heavy thunderstorm the articulated trolleybus 039 must be towed because of damages to the electronic system and electrical equipment.